The food and beverage (F&B) market is the largest segment and is expected to reach $355.7 billion by 2014 at a CAGR of 12.2%. The F&B market owes its growth to the introduction of new components in this segment, as well as increased demand from consumers. U.S. is the largest geographical segment; and is expected to be worth $310 billion by 2014. . Its 12.2% CAGR (2009 to 2014) is driven by the greater availability of products and services, as well as greater consumer awareness in this region. The next largest segment is Europe, which has a CAGR of 10.9%. It is expected to reach $238 billion by 2014. This segment is growing due to the increasing number of products and services in this region. 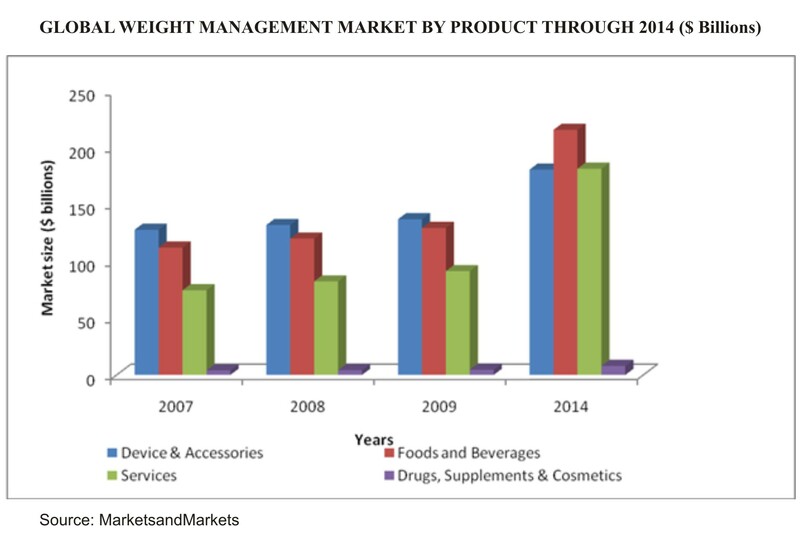 Consumers are becoming more health-conscious and also have greater awareness about the availability of weight management products. MarketsandMarkets, a research and consulting firm, publishes 120 market research reports per year. Each strategically-analyzed report contains 250 pages of valuable market data, including more than 143 market data summary tables, and in-depth five-level segmentation for each of the products, services, applications, technologies, ingredients and stakeholders categories. Our reports also analyze about 200 patents and over 50 companies and micro markets which are mutually exclusive and collectively exhaustive.